Thomas Barnardo died on Tuesday 19th September, 1905, after suffering a series of angina attacks. He was sixty years old. Because of the enormous public interest in the event, special arrangements were made for the funeral. Barnardo's body lay in state at the Edinburgh Castle from Sunday 24th September until the morning of Wednesday 26th. 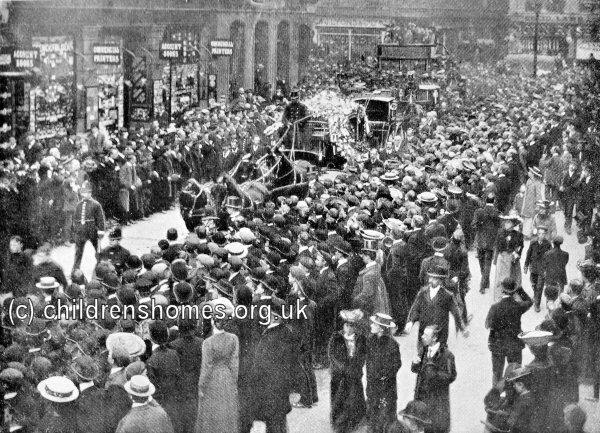 A procession which included the staff and children from the homes and members of the organisation's governing Council followed the coffin as it was taken through London's East End to Liverpool Street Station. 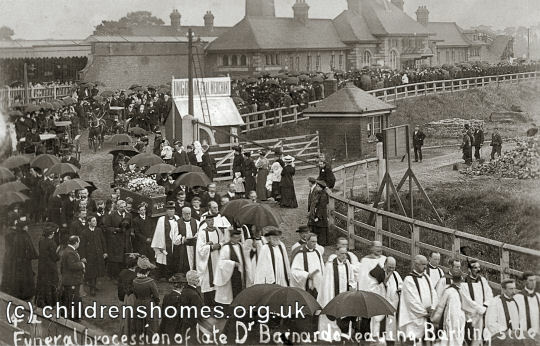 The coffin travelled by a special train to Barkingside station and thence processed to the Girls' Village Home where the funeral service took place in a huge marquee erected on one of the greens. Afterwards, the coffin rested in the home's church then, a few days later, Barnardo's now cremated remains were interred in front of Cairns House. Barnardo was succeeded as Director of the organization by William Baker, who held the post until his death in November 1920. His successor was Rear Admiral Sir Harry Stileman, previously the Captain-Superintendent of the Watts Naval School. Stileman's tenure was relatively short-lived, however. He took up residence at the Girls' Village Home but fell out with the Lady Governors of the Home over a number of matters. The situation worsened after he refused the suggestion by Barnardo's governing Council that he took up residence at another of the homes, and threatened to take his various grievances to the press. Following his eventual resignation in 1923, the Director's post was abolished and control of the organization was placed fully in the hands of the Council.